STC Rocket City Technical Communication Conference, Saturday, April 21! Please join the Society for Technical Communication at the first Rocket City Technical Communication Conference: Techniques and Trends. The event will be held Saturday, April 21 from 9:00 am to 2:00 pm in the Shelby Center on the UAH campus. Topics covered include soft skills for technical communicators, grant and proposal writing, and trends in the Huntsville area. Admission is $25 for non-STC members and FREE for STC members and students. Contact Cynthia Brasher at brasherc@uah.edu to register. More information is available on the STC website. The UAHuntsville Business and Technical Writing Program and the Humanities Center present an Eminent Scholar Lecture on Wednesday, March 7 at 7:00 pm in the Chan Auditorium. Dr. Herndl, a Professor of English at University of South Florida, is a nationally recognized technical communication scholar. 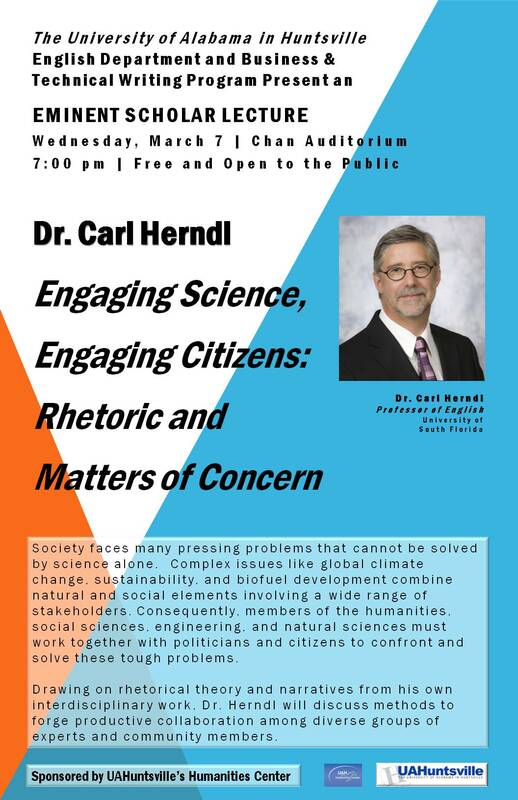 He will speak on the importance of rhetoric in uniting diverse groups of experts, politicians, and citizens to solve large-scale societal problems. The event is free and open to the public. Photoshop Workshop Saturday, March 3! 9:30-12:30: Introduction to Photoshop – This session focuses on editing images using the Crop, Magic Wand, Brush, Eyedropper, Type and Move tools. 1:30-4:30: Advanced Photoshop – This session focuses on using the Clone, Lasso, Quick Mask, Layers, Healing Brush and Layer Styles. The workshop requires pre-registration by Wednesday, February 29. Please contact Cynthia Brasher at brasherc@uah.edu to register. Contact Sue Barbara at sbarbara33@gmail.com or 256.653.6489 with questions about the workshops.